Versatile 2-channel current to voltage converting amplifier, one analogue and one digital output. Most applications of photodiodes and especially those in the ultraviolet wavelength range require special amplifiers because of the small photocurrents. Although the uv-sensors of sglux provide large active areas you mostly may consider using an amplifier. To support your application development we provide you this completely new photodiode amplifier board. 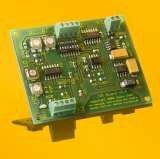 Based on our successful Multifunctional 2-Channel Amplifier Board we included additional features: one analog channel with adjustable Schmitt-Trigger (ST) and a Current-to-Frequency converter (CFC) channel. The CFC clearly simplifies the integration of our photodiodes into digital- and microprocessor based designs.